DIRECTION – NORTH TO SOUTH OR SOUTH TO NORTH? 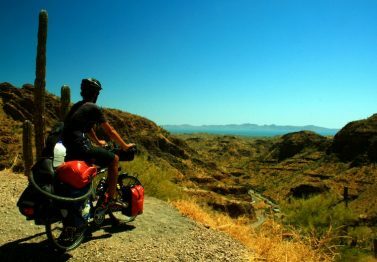 One of the first areas we cycled through when we started our bicycle tour around the world was the Baja California Peninsula. 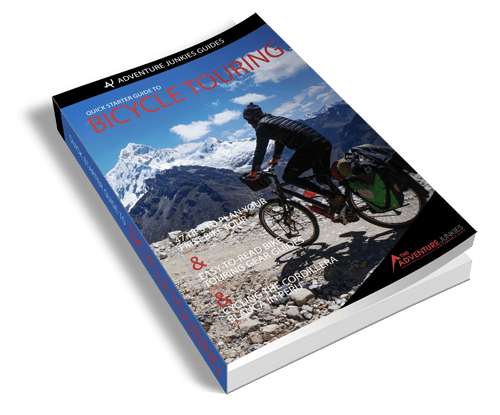 Being a popular route among the bicycle touring community we decided to create this guide to help you make the most of your adventure to this fascinating part of Mexico. We hope you like it and find it useful. 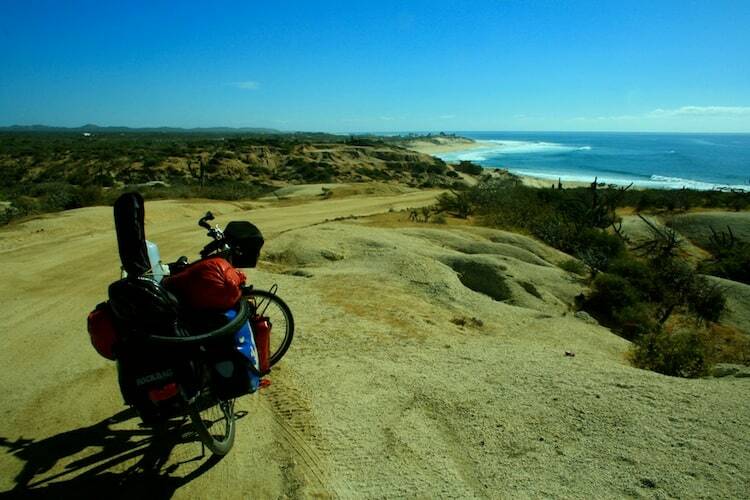 It can take anywhere between 2 to 4 weeks to cycle the entire length of Baja. If you are a fast cyclist and go lightweight you only need 10-15 days. On the other hand, if you prefer taking your time, plan on doing some side trips and stop to relax every 3-4 days you will need about a month. Being such a long peninsula (1,220 km/760 miles), the weather in Baja is not consistent within the whole territory. However, there are basically 2 main seasons. From June to October, the summer time, the weather is the hottest. Temperatures can rise up to 40º C (100º F) in some parts, making cycling during the day very challenging. This season is also the “hurricane season” which can bring some showers, especially in the southern half. The quantity of showers varies a lot from year to year. December to April is the best time to cycle as the temperature drops and so do the showers. It’s also the whale season. 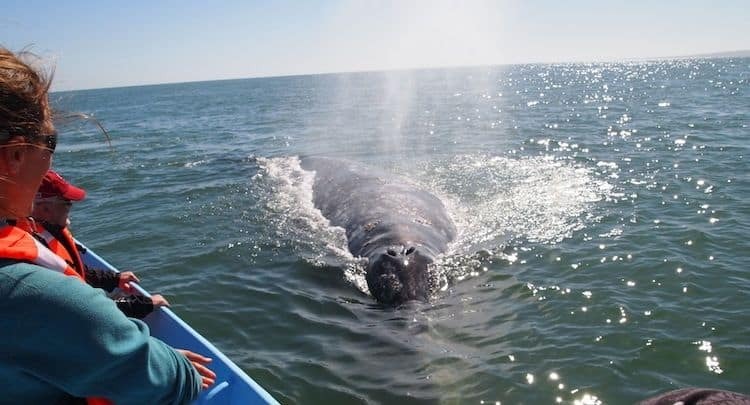 Check out the “side trips” section for detailed information about where you can get close to the Grey whales who visit the Baja Peninsula every year. 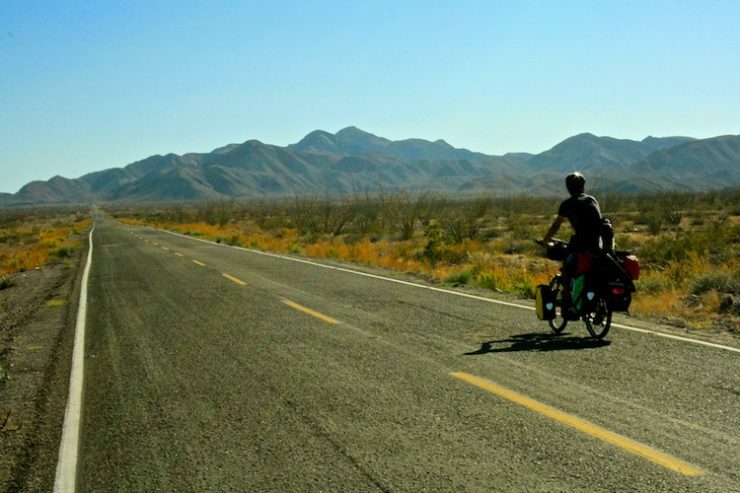 Due to the conditions you will face when cycling the Baja Peninsula, there are a few essential items you will need to bring with you apart from the gear you normally use when bicycle touring. 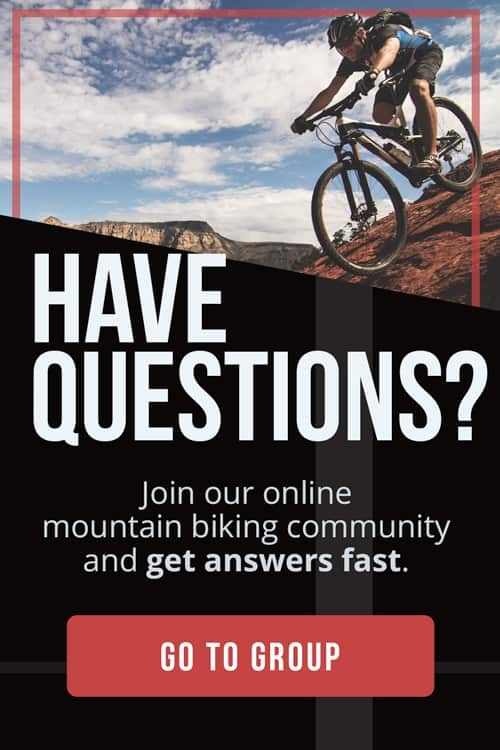 If you plan to get off highway 1 and hit the backroads, which we recommend, you will need to bring a mountain bike with dirt road tires (at least 1.75 wide). Most of the best trails are unpaved with lots of stones and sometimes soft sand. Bringing a road bike will limit you to stay on the main highway all the time. As you will be crossing a desert, the towns can be far apart. For that reason you will need a system to carry plenty of water with you. We love our 10L dromedary bags, but anything that can hold at least 5 liters of water would work. The main highway doesn’t have a shoulder and traffic can be heavy at times. We strongly recommend to bring a good mirror with you to keep an eye on the trucks passing by. Also, it’s not the place to sleep in a camping hammock, as there are not many trees around (mainly cactus). 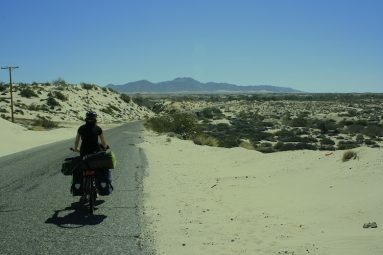 You don’t really need a map to cycle Baja, as there is only one main highway and some detours from it. But if you are like us, you like spending time exploring the little trails and the lesser visited areas, here are some options for you. Basic Baja California maps are sold by many petrol stations, grocery stores or book stores around the peninsula for a few dollars. According to Ira Sutherland, REI in San Diego has National Geographic maps that have topographic lines at 100 m intervals. Mexico’s Department of Transportation has useful detailed road maps for all of Mexico. 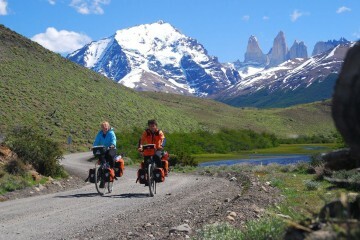 They have been posted online by a Bicycle tourer named Nico and can be downloaded here. You can’t drink the water from the tap in Mexico and the towns are sometimes far apart in Baja so you will need to plan accordingly. The first thing you need, as I mentioned before, is a way to carry a few liters of water on your bicycle. A proper water sack or a big plastic bottle (the galon ones you can by in the stores are quite handy) will do the job. To find drinking water, the cheapest option is to visit the water stations at every town. They are called “purificadoras” and you can get a few liters of drinking water for around a dollar. Most of the time they didn’t even charge us. Another option is to bring a filter or another purification system (like tablets for example) with you. Then you only need to get the water from the tap and treat it accordingly. We use and recommend the MSR Miniworks EX Water Filter. The last solution is buying bottle water which is expensive, uses a lot of plastic and your money goes directly to Coca-Cola. This is always the dilema. Which direction to go. Everyone we’ve met and read on the web has their own theories to explain which one is better than the other. For us, there isn’t one better than the other. Each one has it’s own advantages and disadvantages. Most people will tell you the wind normally comes from the north, which suggests heading south will the easy way to go. 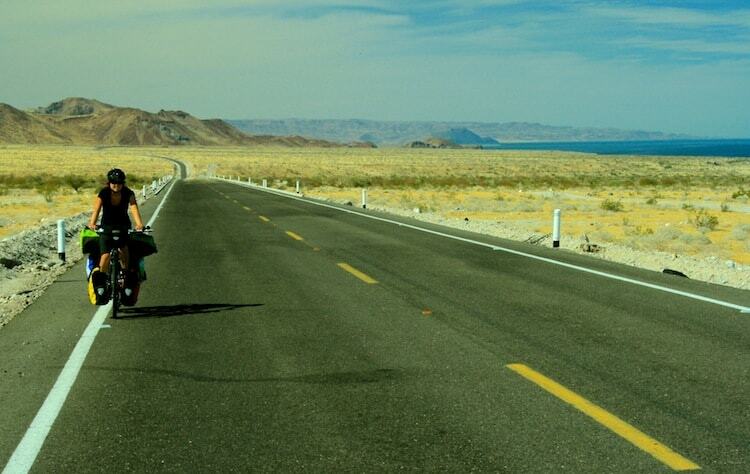 In our experience, we faced some days of headwind while heading south, especially on the coast of the Sea of Cortez, and other days with tailwinds when cycling the middle section of the peninsula. The wind is not consistent, it changes all the time and we wouldn’t recommend to chose the direction based exclusively on the wind. Starting in San Diego can be very handy to stock up on supplies you might need for the trip. REI is well stocked, you can find almost anything and at a good price. Another consideration is crossing the border in Tijuana is much faster and convenient when crossing into Mexico than into the U.S. See the visa section for specific details about the crossing. ACCOMMODATION – WHERE TO SLEEP? 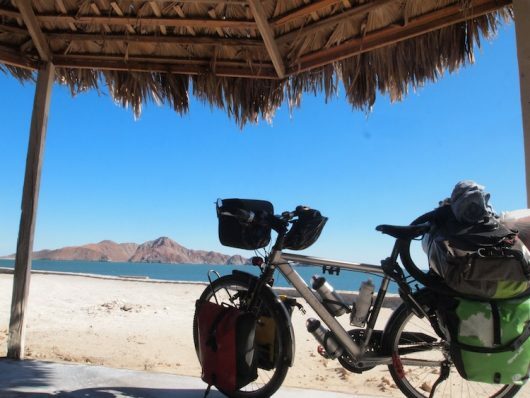 Depending on your touring style you will find different options to sleep while bicycle touring across the Baja Peninsula. Wild camping is very easy and highly recommended. The night’s skies are always covered by millions of stars that make the experience very enjoyable. If you are concerned about safety, ask any restaurant by the side of the road to camp in their surroundings. We were never turned down. 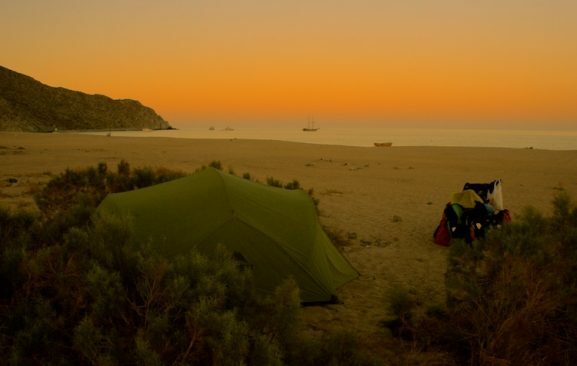 Another great option is to camp at one of the many isolated beaches around. The areas closed to the border are not recommended to wild camp on your own. There are also plenty of paid camping areas in most of the towns. 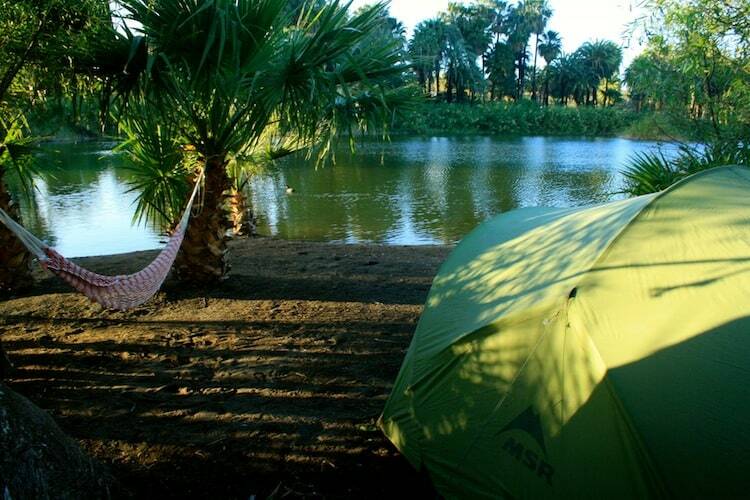 Many tourists explore Baja by RV, so RV parks can be found all over the peninsula. They normally have space for tents as well. Another option is checking into a hotel. These are not very cheap. The best deals we found after a lot of bargaining, was 18 USD for a double room. Hotels tend to be in the bigger towns. And lastly, if you are passing through Ensenada, don’t forget to check out the Casa de Ciclistas. You can find all the details on Warmshowers. 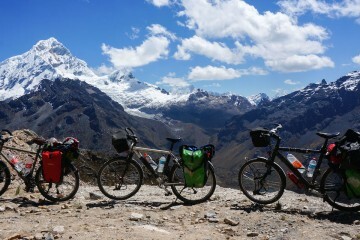 Mexico is by far our favourite country we’ve visited since we began to travel around the world on our bicycles. 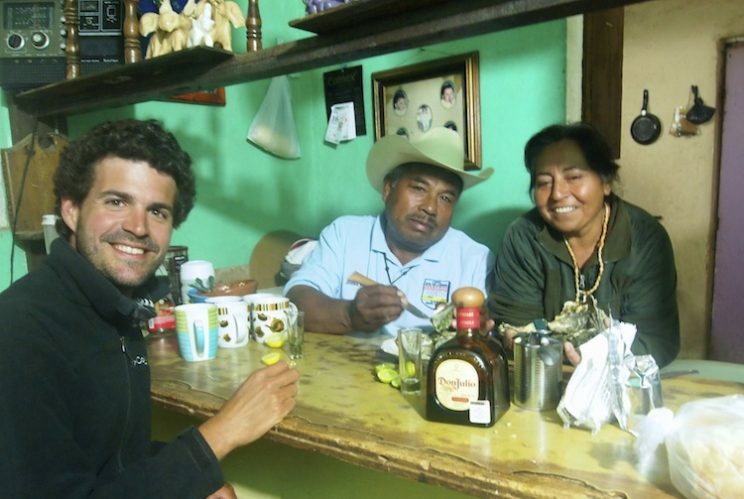 Mexicans are very friendly and welcome travelers, making you feel at home. Add great food, fascinating culture and gorgeous scenery and you get a wonderful destination for your next trip. That doesn’t mean you shouldn’t be alert, like anywhere you travel in the world. Some areas in the big cities like Tijuana could be a problem, so it’s better if you avoid if possible. For us the real danger in Mexico is the traffic. The truck drivers drive very fast and don’t normally give you much room when they pass you. 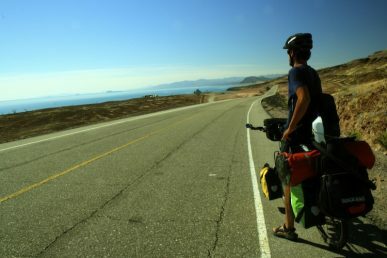 Highway 1 doesn’t have a shoulder most of the time so you should bring a mirror and keep an eye on it when pedaling on this road. Most nationalities (USA, Canada, Europe, Australia & New Zealand) get 6 months visa upon arrival when entering Mexico. The exit tax is 295 Pesos and needs to be paid before leaving the country. If you are leaving by plane, this tax might be included on your flight ticket already. If you are planning to cross the border at Tijuana, this information is very important. You don’t need a visa if you are not traveling south of Ensenada or for less than 72 hours. The crossing is a simple door you cross and then you are in Tijuana. So your passport won’t get stamped unless you go to the office and ask for it. The customs are on the first door on your right once you pass that door. If you don’t get the stamp, you will have to pay a 100 USD penalty fee when leaving the country, so you better get that entry stamp! 1474 kilometers (915 miles) is the distance between Tijuana and La Paz. These two cities are linked by the highway 1 that zigzags it’s way down the peninsula going from one coast to the other one in repeated times. 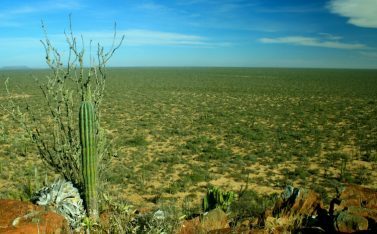 The scenery is mainly desert crossing different Nature Reserves like “El Valle de los Cirios”, “Reserva de la Biosfera de Vizcaíno”or the stunning “Bahía de Concepción”. For detailed information about what you can encounter on the main highway, including distances, climbs and other useful tips, check out this guide. The road is entirely paved and has no shoulder. The traffic can be heavy at times making the cycling a bit risky in some areas. For that reason, we strongly recommend to get off highway 1 as much as you can. Hitting the dirt roads in Baja is a tough adventure. Expect slow progress, remote areas, soft sand and very few people but the rewards of exploring the real Baja outweigh the challenges. 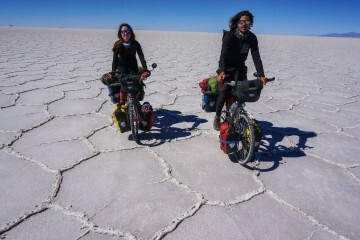 It’s 466 kilometers (289 miles) and it takes around 6-7 days to complete at a relaxed pace. 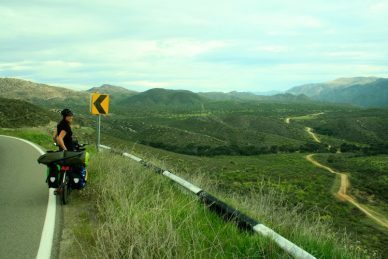 The road climbs to leave Ensenada and then stay steady (small ups and downs) from Ojos Negros onwards. Once on the coast it’s mainly flat. When we were there in 2013, the road was paved all the way to Bahia Luis Gonzaga. From there, there was a very dirt road back to highway 1. There is not much traffic which makes the cycling very pleasant. 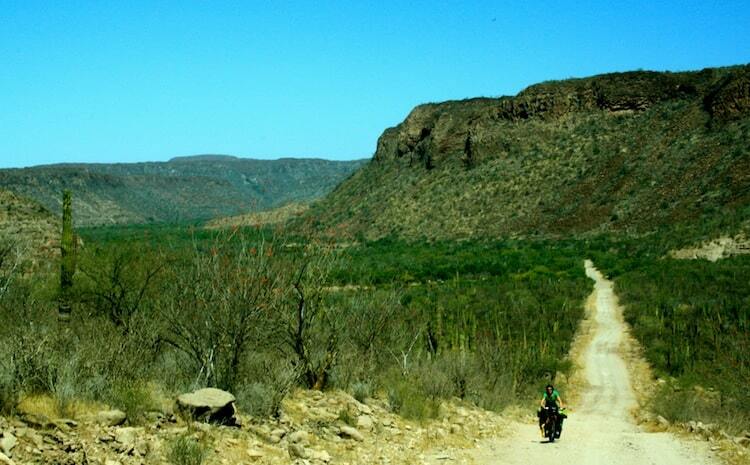 The scenery is rocks and mountains for the first 100 kms, then open desert until you get to San Felipe. After that, possibly the best stretch of the whole peninsula starts. 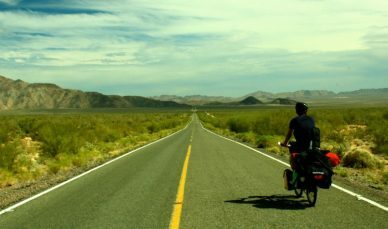 A new-paved road with a wide shoulder heads south with the turquoise waters of the Sea of Cortez on your left and a desert landscape on the right. It’s 137 kilometers (85 miles) and it takes 2-3 days to complete. You will need wide tires for this route as the entire road is unpaved. There is also a section after San Javier with soft sand so a bit of pushing is required. The road climbs steeply to San Javier but the traffic is almost non existent. This small mountain town is home of a famous Mission, one of the religious outposts built by the Spanish to spread the Christian doctrine among the locals, which can be found all around Baja California. After San Javier the road is mainly flat, the scenery opens up so there is little shade. You will also encounter soft sand making progress very slow at times. This loop is 427 kilometers (265 miles) and it takes you to the very end of the peninsula. The section that makes this loop worth it is the unpaved road from San José del Cabo to Cabo Pulmo. 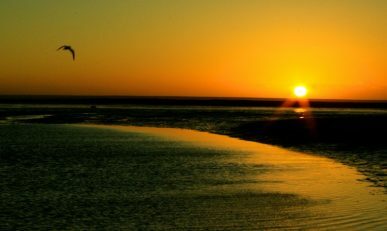 On that strech you will be pedaling empty roads by the ocean with great opportunities for camping at many of the beautiful beaches you will pass by. Water can be a problem here so make sure you pack enough for this section as there are very few spots where you can find it. You will also need wide tires to cycle on this dirt road. Some sections have soft sand so a bit of pushing is needed sometimes. Interacting with Grey Whales is a one in a lifetime experience. One of the peculiarities of these creatures is they have the ability to feel affection. Therefore, it’s very common for the whales to come close to the boats looking to be touched. Although you can see Grey Whales at other places in Baja, the Laguna Ojo de Liebre is the cheapest of all of them and you will get the welcoming of the Mexican lancheros. No big tour operators here. Only local Mexicans from the Ejido Benito Juarez (a community cooperative), where the Laguna is located. Visiting the cave paintings in San Francisco is a whole adventure in itself. Overnight trips are available and require hiring a guide and mules to carry the camping gear and finding the way to the caves. It takes a minimum of 2 days for the round trip. The INAH doesn’t allow travellers to hike independently to where the paintings are. You will need to organize this in San Ignacio with a tour company or, if you speak fluent Spanish, in San Francisco directly with the INAH. 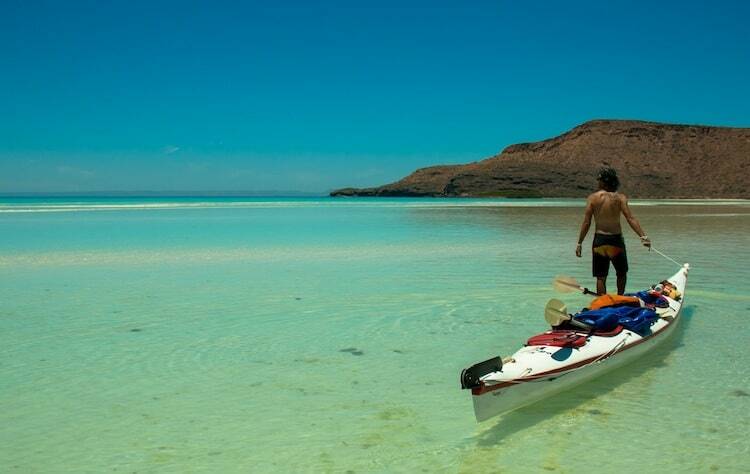 We spent one week exploring the beautiful Island of Espíritu Santo by kayak in the Sea of Cortez, about 20 km from La Paz, Baja California. If you like enjoying the nature in solitude, exploring areas where there is no civilization and feeling conected to the surroundings, then Espiritu Santo Island is for you. We absolutely loved the week we spent there. It was one of the highlights of Baja California. 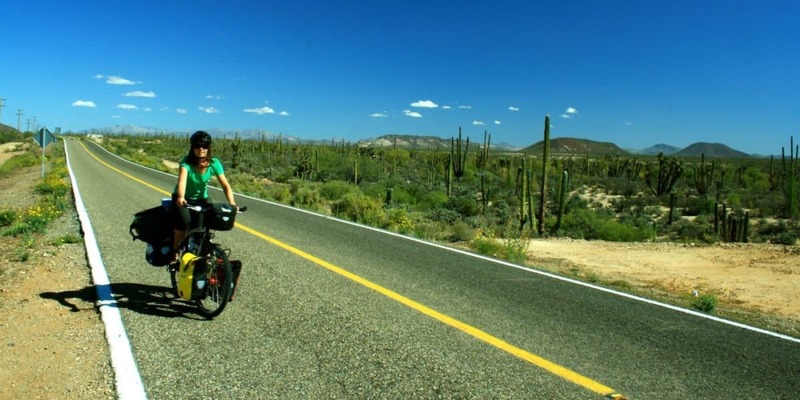 Cycling Baja California can be done on almost any budget. However, the area is not as cheap as the rest of Mexico. Prices here are considerably higher than in the rest of the country but still cheaper than those in the U.S., Canada or Europe. 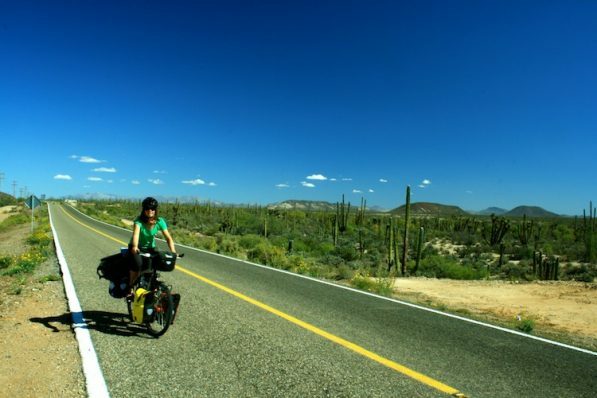 Don’t forget to check our Travel Budget to Cycle Baja California. We are budget travelers and managed to spend around 7 dollars per person per day. A simple double room with bathroom onsite in a hotel costs around 20-30 USD. Camping areas and RV parks charge around 8-10 USD to pitch the tent. These prices are normally negotiable, so bargain hard but always with a smile. Eating in a restaurant is expensive for Mexican standards. A set meal costs about 5-9 dollars. However, taco stands are everywhere and these are cheap and tasty. In our case, we didn’t find tacos filling enough after a day on the saddle, so we used to cook our pasta and then go to the taco stands to sample some local food. If you plan to sleep in a room every night and eat at a restaurant twice a day, you will need around 30 dollars a day. If you want to check into a room once every few days and sample some of the local food, then you will be looking at around 15 dollars per day. If you plan to wild camp and cook your own meals you can easily get by on 5-10 dollars per day. The mexicans. Great people, always smiling and chatty with the travellers. Getting close to Grey Whales at Laguna Ojo de Liebre. Gorgeous scenery through all the peninsula. 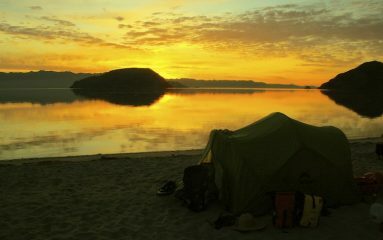 The beaches of the Sea of Cortez: Luis Gonzaga, Bahia Concepción, around La Paz, Cabo Pulmo and many others. Local food. We became addicted to the taco stands! The traffic. It can be dangerous in some spots of highway 1. 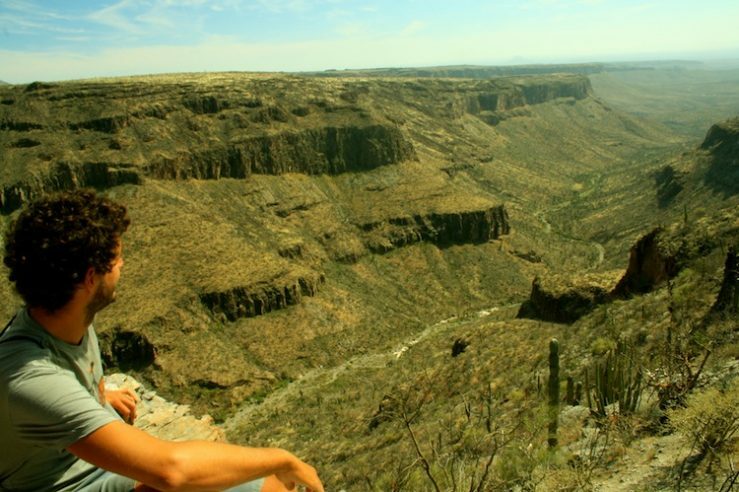 Get off the highway 1 as much as you can and explore the backroads to discover the real Baja California. Learn a bit of spanish and have conversations with the locals. They are looking forward to know about you! Take your time. Enjoy day by day and embrace the Mexican pace of life. Allow enough time so you can stop whenever you want to explore the back roads, take side trips off the bike, meet local families and taste the local food.